During the test, you lie on a table that moves underneath a scanner called a gamma camera. The camera detects the radiation produced by the gallium. Images display on a computer screen. During the scan, it is important that you keep still to get a clear image. The technician can help make you comfortable before the scan begins. The test takes about 30 to 60 minutes. Several hours to 1 day before the scan, you will get an injection of gallium at the place where the testing will be done. Just before the scan, remove jewelry, dentures, or other metal objects that can affect the scan. Take off the clothing on the upper half of your body and put on a hospital gown. 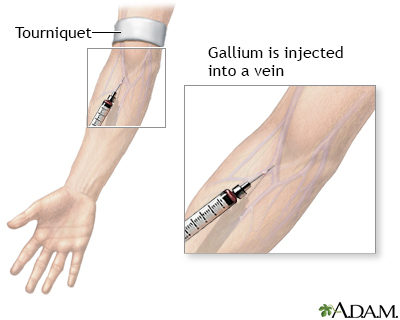 The injection of gallium will sting, and the puncture site may hurt for several hours or days when touched. The scan is painless, but you must stay still. This may cause discomfort for some people. This test is usually done when you have signs of inflammation in the lungs. This is most often due to sarcoidosis or a certain type of pneumonia. The lungs should appear of normal size and texture, and should take up very little gallium. There is some risk to children or unborn babies. Because a pregnant or nursing woman may pass on radiation, special precautions will be made. For women who are not pregnant or nursing and for men, there is very little risk from the radiation in gallium, because the amount is very small. There are increased risks if you are exposed to radiation (such as x-rays and scans) many times. Discuss any concerns you have about radiation with the health care provider who recommends the test. Usually the provider will recommend this scan based on the results of a chest x-ray. Small defects may not be visible on the scan. For this reason, this test is not often done anymore. Gotway MB, Panse PM, Gruden JF, Elicker BM. Thoracic radiology: noninvasive diagnostic imaging. In: Broaddus VC, Mason RJ, Ernst JD, et al, eds. Murray and Nadel's Textbook of Respiratory Medicine. 6th ed. Philadelphia, PA: Elsevier Saunders; 2016:chap 18. Harisinghani MG, Chen JW, Weissleder R. Chest imaging. In: Harisinghani MG, Chen JW, Weissleder R, eds. Primer of Diagnostic Imaging. 6th ed. Philadelphia, PA: Elsevier; 2019:chap 1.